If you love what you’re wearing at your wedding, you’re sure to have more fun—and it’ll be evident throughout the day, in person and in your photos. 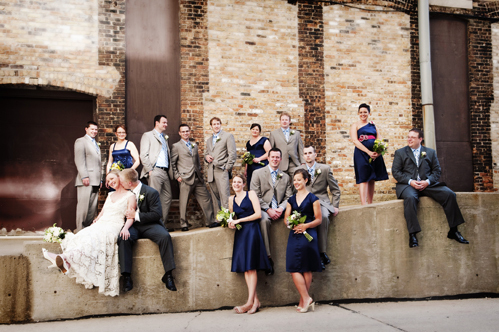 It should be no surprise that Southeastern Wisconsin boasts a wide variety of attire options for brides, grooms and all the other VIPs. Whether your heart’s set on a designer label or you’re working with a tighter budget, the bridal salons and tux shops on this list have the attire and accessories that will make you and your wedding party look and feel fantastic. We’ve also included some local designers who are happy to help you bring the gown or tux you’ve envisioned to reality. Note: The contents of this guide were checked for accuracy when this article was updated on April 15, 2013 at 8:12 p.m. We continually update the articles on WedInMilwaukee.com, but it’s possible some details, specials and offers may have changed. As always, we recommend you call first if you have specific questions for the businesses mentioned in the guide. Did we miss a local bridal salon, tux shop or gown designer? Let us know in a comment below, or email us! Miss to Mrs. Bridal Consignment Boutique will be opening their doors the weekend of Jan. 18th! We are located in the East Troy Village Square – 2893 Main Street, Suite C. East Troy, WI 53120. 262-684-2899. We will be open on weekends by appointment only. Please add MinkMaids to the list of gown designers! I designed and made the navy bridesmaid dresses in the Front Room Photography picture featured in this article. Besides bridesmaid dresses, I also create many other custom special occasion pieces – bridal gowns, Mother of the Bride/Groom dresses, Flower Girl dresses and coordinating clutches for the entire bridal party.